Take advantage of the nice weather and eat your meals on the patio on this stylish 6 Piece Black Patio Garden Table Set with Umbrella. You can enjoy this set quickly, assembly of the table goes up in minutes and the chairs come fully assembled. The folding chairs are upholstered in a durable textilene material, designed for all-weather use. 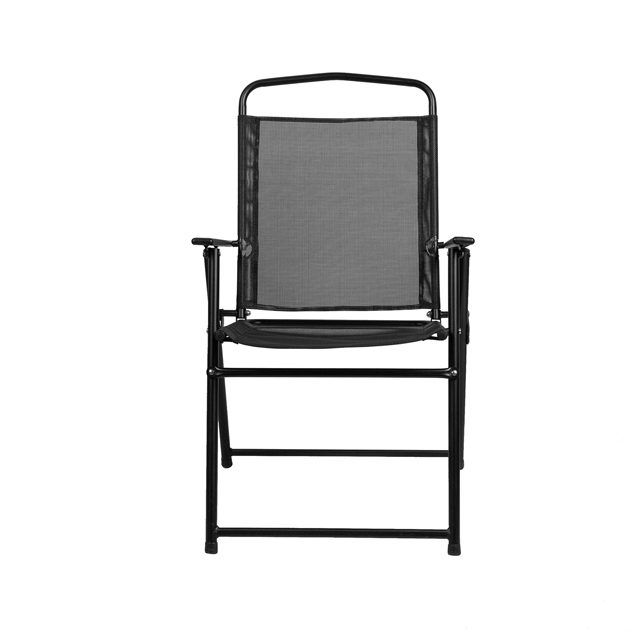 If you want to relocate your seating to another location on the deck, sit poolside or take with you while camping or to an outdoor sporting event, the lightweight and compact design offers an easy to transport option. The attractive rippled tempered glass sits atop a 4-legged metal framed base. The included umbrella will shade you on those sunny days and has a tilt function that is activated by pushing the plastic ring on the pole. For longevity, care should be taken to protect from long periods of wet weather. Clean with a water based cleaning solution to keep in pristine condition. Take the stresses of the day away with this all-in-one table set that was built for dining, entertaining, relaxing and card games.